It’s tough to not be impressed by the feature-packed Samsung Galaxy Note 9. It packs plenty of power, has a gorgeous curved display, and sports a souped-up S Pen stylus capable of doubling as a remote control. But for all it’s tempting features, this phone is still a glass sandwich that runs the real risk of picking up scratches or cracking if dropped. 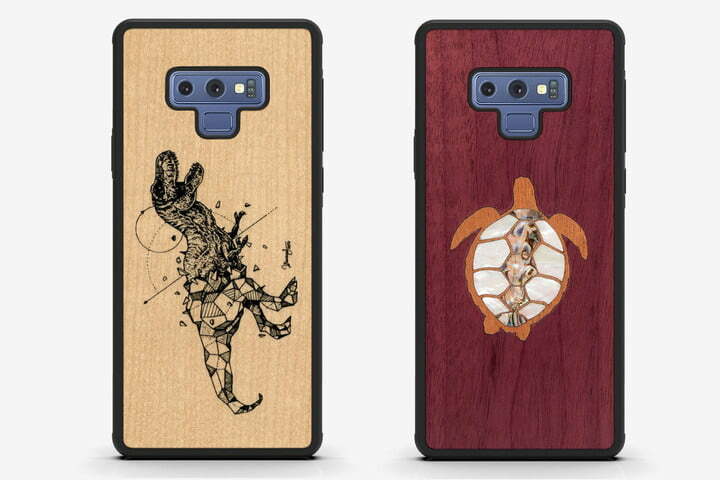 Check out some of the best Galaxy Note 9 cases and get yourself some protection. 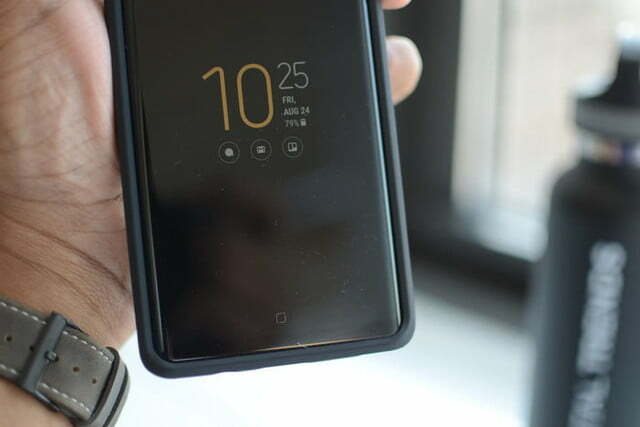 You may want to pair your new case with one of the best Note 9 screen protectors for complete coverage. 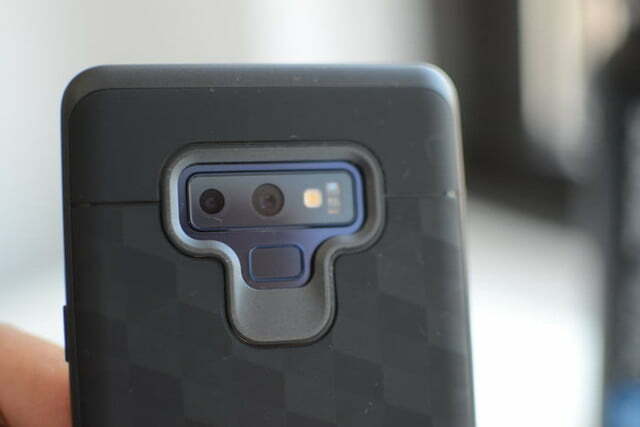 We’re still trying out a number of Note 9 cases, but the following are two we wholeheartedly recommend. 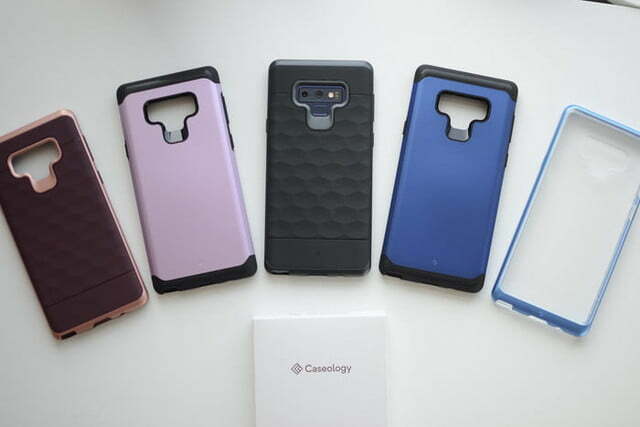 This smart design from Caseology looks and feels more expensive than its price tag. 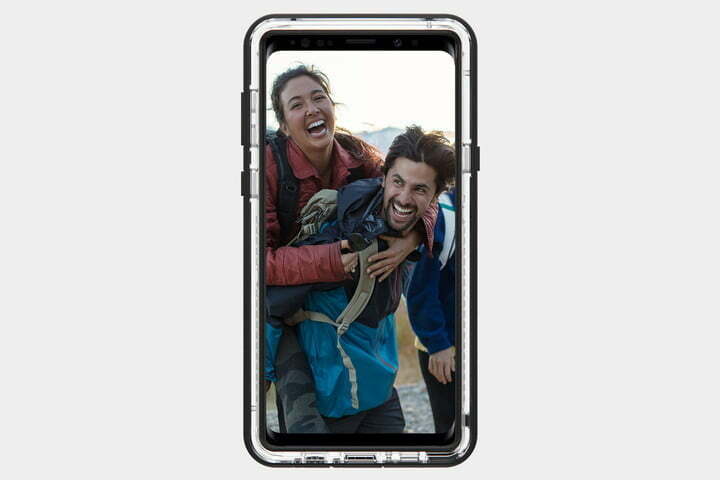 The slim inner layer is made from flexible TPU for shock absorption, while a polycarbonate bumper around the frame adds a second layer of protection. 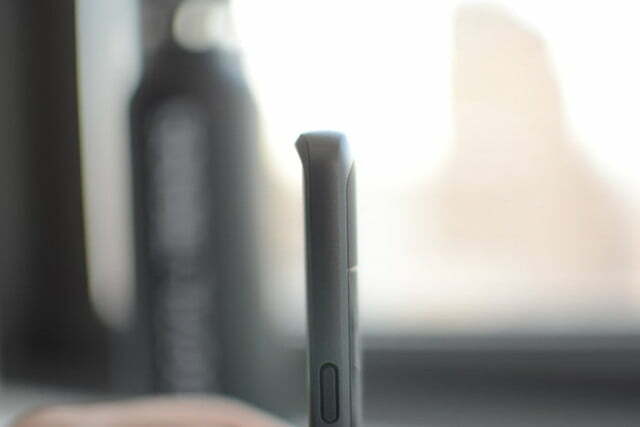 The cutouts are large enough to ensure the case doesn’t interfere with any of the phone’s functions and the button covers do their job well — it’s very easy to pull out the S Pen from the bottom. The case doesn’t pick up too much dirt or lint, and there’s also a slight raised lip at the top and bottom to protect the screen. The parallax design on the back feels nice to the touch. This design comes in blue, black, or a contrasting mix of pink and burgundy. 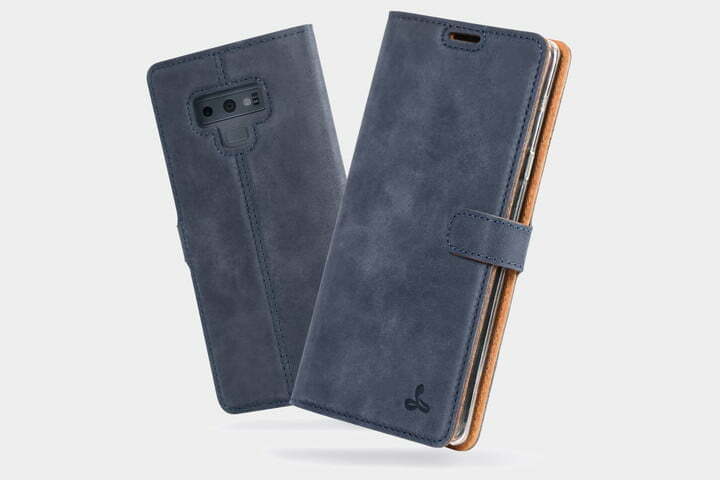 Caseology’s Legion and Skyfall cases also fit the Note 9 really well, though we think the Parallax looks the best. Dual-layer cases that combine flexible and hard materials are commonplace now, but Incipio designed one of the first with its DualPro series and it’s still going strong. 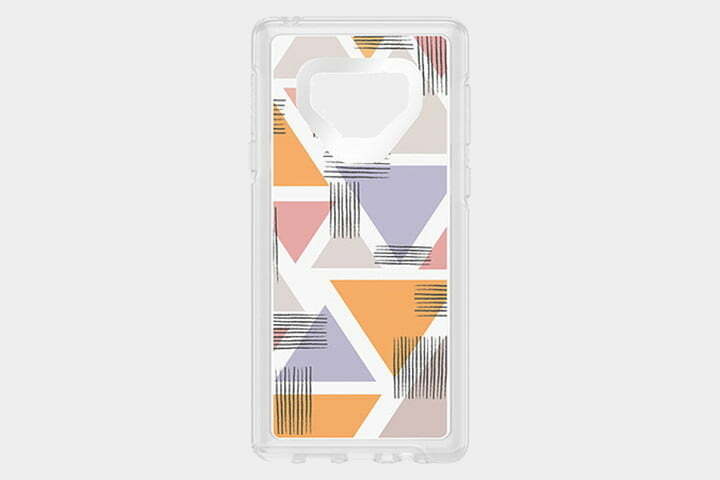 This case has a shock-absorbing interior wrapped in a tough polycarbonate shell. 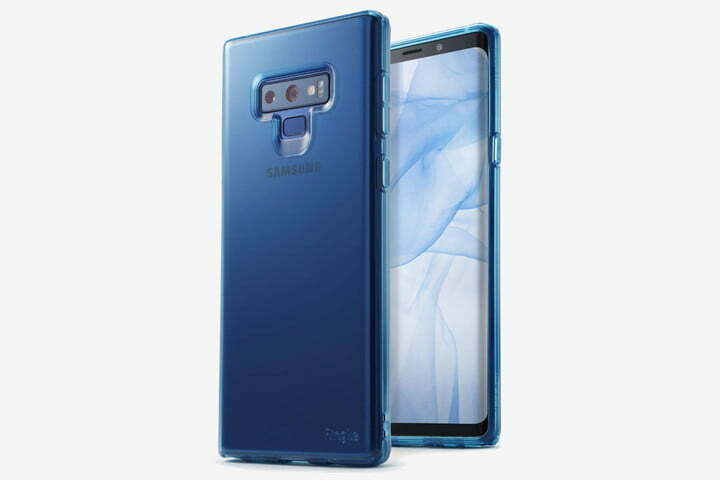 It will cushion your Note 9 in the event of a fall from up to 10 feet. It does add some bulk to an already big phone, but that’s the price of proper protection. The material feels nice to the touch and there’s a lip around the screen on the top and bottom, accurate cutouts, and chunky covers that make the buttons easy to find and use without looking. Taking the S Pen out of the Note 9 with this case on isn’t too easy, but you get the hang of it after a few tries. If you like a smart and protective wallet for your phone, then Noreve should be your first port of call. These leather wallet cases are fully customizable, so you can choose the color and grain, as well as optional extras like a belt clip or a personalized painting. The Tradition B has a couple of slots for credit cards or ID, a larger pocket in the inside of the cover, and there’s a stud closure to keep it closed. 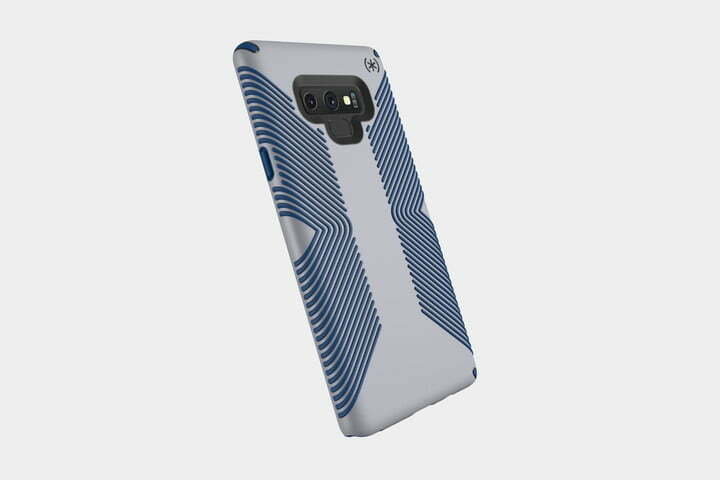 Your Note 9 sits snugly in a TPU shell, protected from every angle. The catch is that they’re not cheap. Go with plain synthetic leather and prices start at $50, but with real leather and a hand-painted finish, the price is closer to $200. Cases from Urban Armor Gear can be a bit busy and industrial-looking, but the Plyo scales things back to the essentials. This translucent case, which is also offered with a crimson tint, has reinforced corners to guard against drop damage and textured sides to enhance your grip. Testing involved drops from four feet (typical holding height) 26 times, so you can be confident your Note 9 is safe. The chunky button covers are easy to find and use without looking. This is the thinnest case UAG offers, so there are no worries about Samsung Pay or wireless charging working. It does also have a slight lip top and bottom to help protect the screen. Working out of Indiana, the skilled case makers at Carved offer some of the best-looking cases on the market. The shell itself is a simple, slim, black, plastic shell with a bit of flexibility and textured sides that help prevent it from slipping out of your hand. What makes these cases special is the wooden inlays in the back. Plain wood starts at $24, or you can opt for painted designs from around $40. There are also some options that stir shell into the mix for $55. They only offer basic protection from minor bumps and falls, but each one is unique, and they look great. Maybe you just want to keep things simple and cheap. This translucent Ringke case comes in clear, blue, or black varieties and offers a thin layer of protective TPU. The button covers are well-defined, the cutouts are big enough, and there’s a lanyard hole in the bottom corner so you can attach a strap. The dot design prevents marks from showing up. 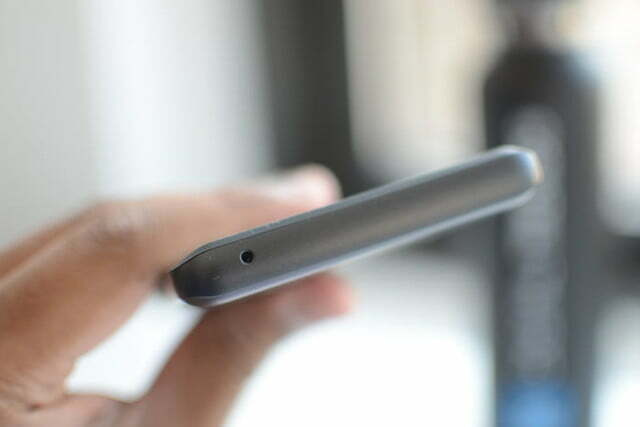 It’s slim, so drop protection will be limited, but there is a raised bezel to keep your screen from touching down. One of our favorite case series, the Presidio Grip is also a dual layer case with flexible material surrounded by a polycarbonate shell that safeguards your Note 9 from drops of up to 10 feet. It also has chunky button covers, accurate openings, and a raised lip to protect the screen, but what sets it apart is the ridged pattern that adds a flourish of style and serves a practical purpose in enhancing grip. This slim case comes with a back panel in black canvas or walnut wood. It offers basic protection from bumps and minor drops, but the real attraction is the ability to add Moment’s lenses for enhanced photography, which can be securely attached to the case. You can pick up a wide lens for $100, a superfish lens for $90, and lots more. You can also fit a filter mount for $40 and buy an array of filters to get the precise look you want. 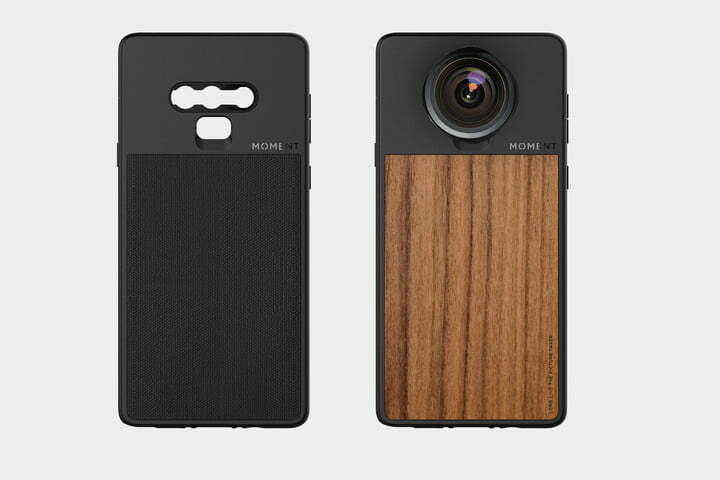 If you want more from the Note 9’s excellent camera, then you need to check out Moment’s wares. Offering excellent drop protection Otterbox’s cases are fashioned from a combination of flexible rubber and hard polycarbonate. The Symmetry Series isn’t quite as protective as the Defender, but it’s also less bulky and restrictive. You can get the usual combination of complementary colors, but there’s also an eye-catching triangle design for people who want something less muted. 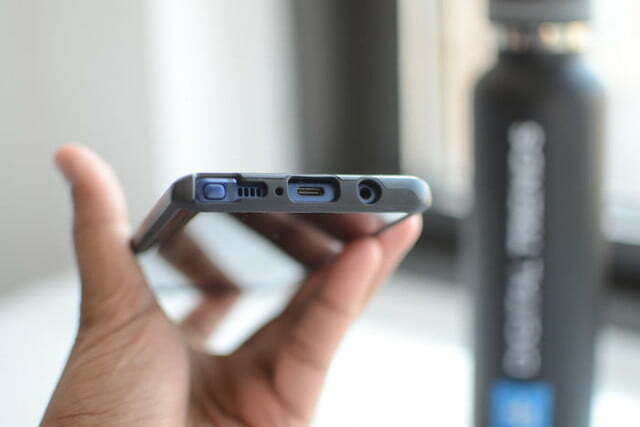 The button covers, generous cutouts, and raised lip to safeguard the screen are all spot on. If you’re a fan of folio-style wallet cases, then this one from Skech may interest you. 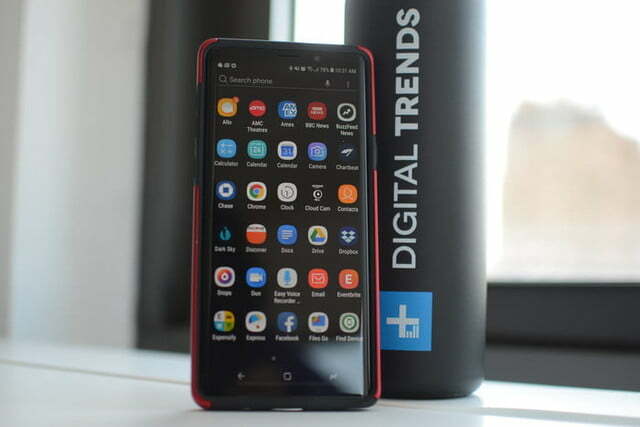 Plain black styling gives it a business feel and the synthetic covering is durable with cutouts for the camera and fingerprint sensor on the back. Open it up and you’ll find three slots for cards, with the front one windowed for an ID, and a money pocket behind. 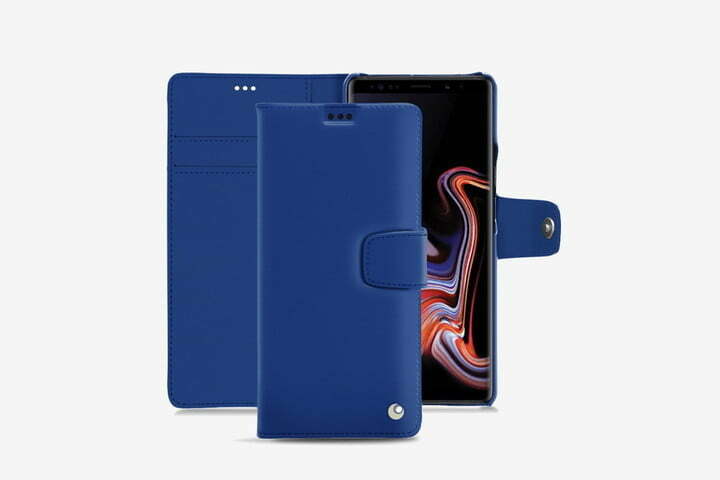 Best of all the minimal hard shell that holds your Note 9 in place is detachable for when you want to travel light. 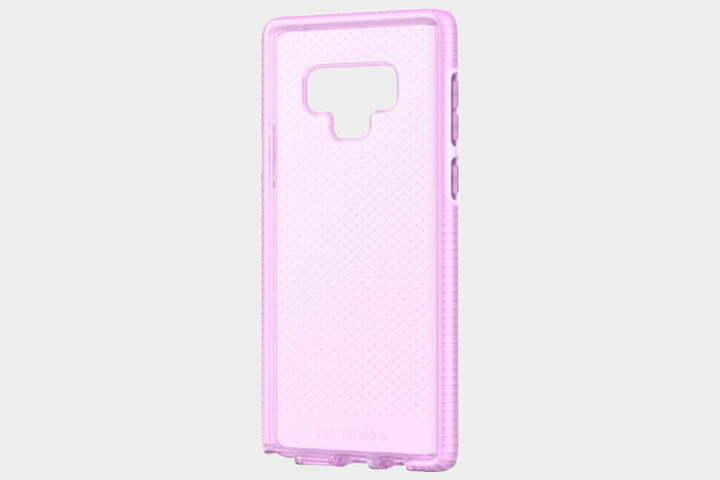 This slim, transparent, check-patterned case comes tinted in orchid pink, ultra violet purple, or smokey black and the ridged bumper section provides impressive drop protection for falls of up to 10 feet. 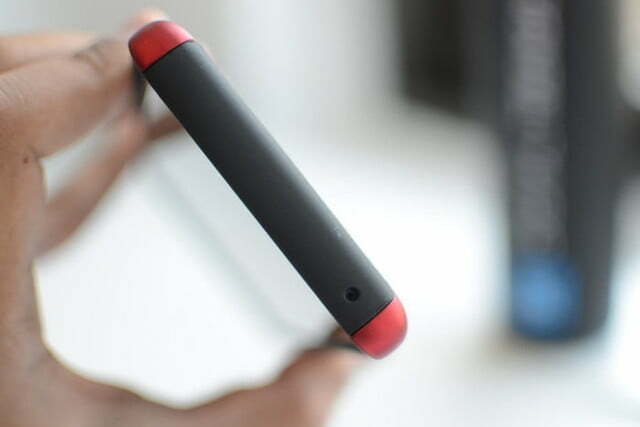 It allows easy access to everything and has the usual raised beveled edge at the front to safeguard the screen. 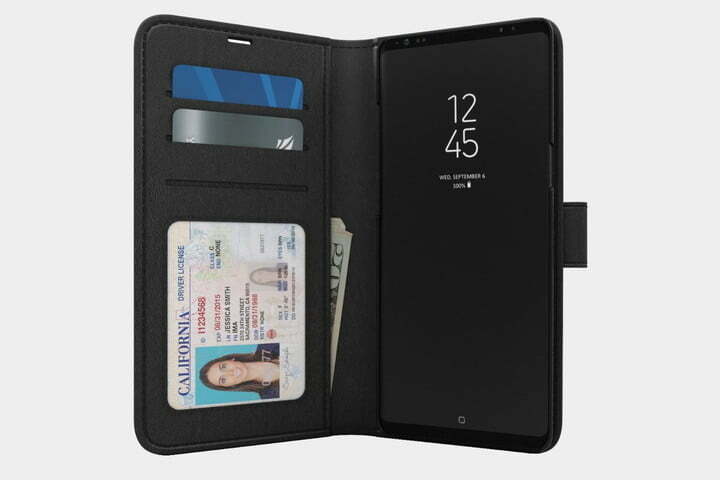 This case is also easy to grip, so you’re less likely to drop your Note 9 in the first place. If you’re after a good-looking, real leather case, then you could do a lot worse than Snakehive. Crafted from full grain cowhide nubuck leather, these wallets cases come in a range of interesting colors from burnt orange to navy. You’ll find three card slots in the cover alongside a larger money pocket and there’s a magnetic clasp to keep the cover securely closed. 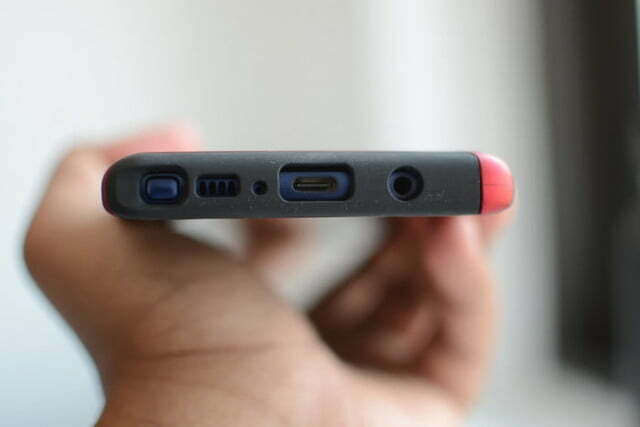 A basic plastic shell holds your Note 9 in place, but there are cutouts for the ports and camera. 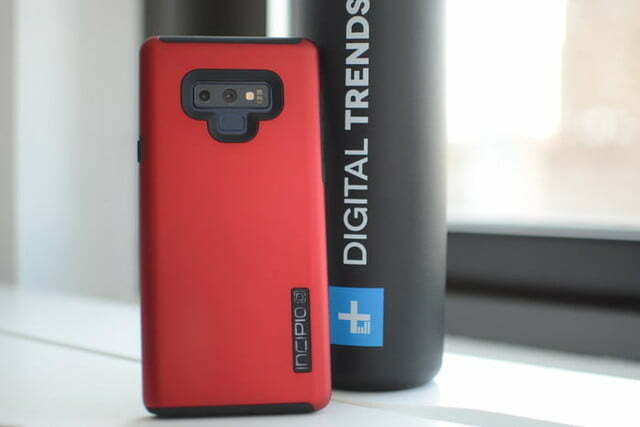 You may want to avoid covering up Samsung’s stylish design, in which case this simple, flexible, transparent TPU case could fit the bill nicely. You’ve got the full range of cutouts required, slim button covers, and air cushions in the corners to help deflect drop damage. 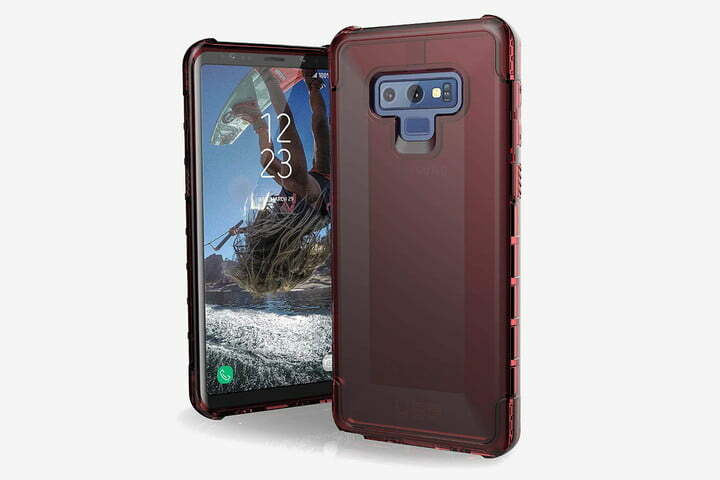 Don’t expect rugged protection, but this case should be enough to ward off scrapes and protect your Note 9 from minor drops. The textured back of this official case from Samsung reminds us of strengthened luggage, but it also enhances grip considerably. 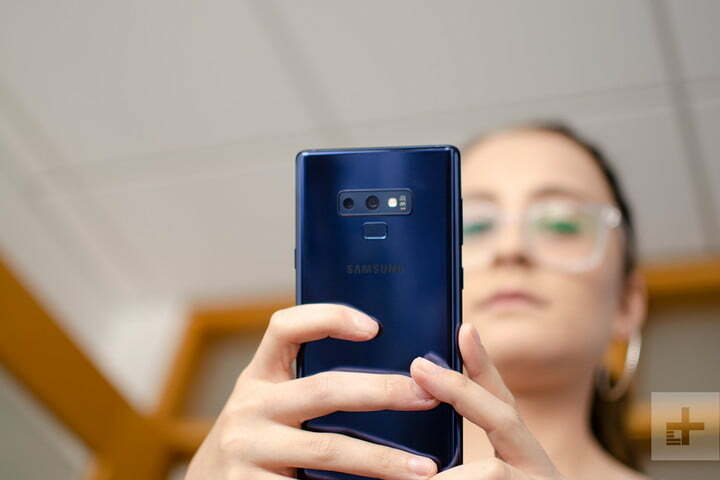 It has well-defined button covers, accurate openings for everything from the camera to the S Pen, and it comes in black or grey. 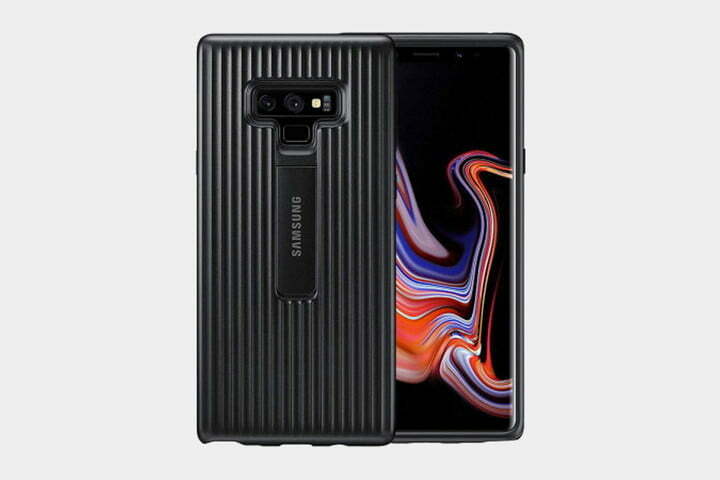 The headline feature is the kickstand on the back which bears the Samsung logo – perfect for propping your Note 9 in landscape and enjoying a movie on that impressive 6.4-inch display. Will your Note 9 be accompanying you on adventures into the great outdoors? This could be a good case for you if you want protection against dust, dirt, and snow. 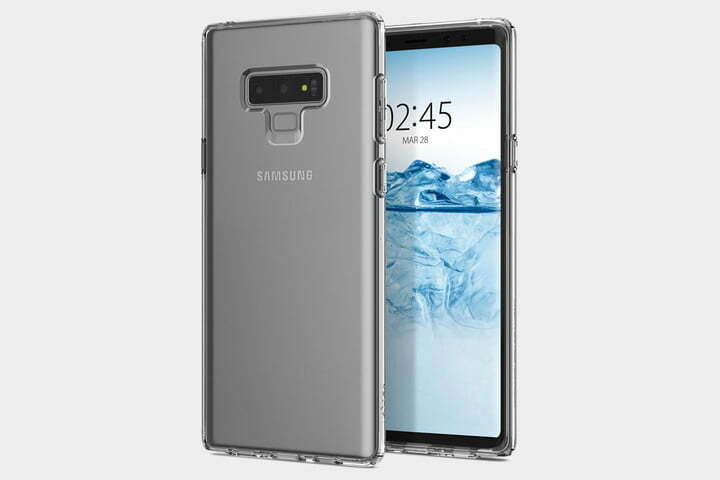 It forms a tight seal with your Note 9 shielding your ports, buttons, microphone, and speakers and preventing anything unwanted from gaining access. The thick bumper section also provides protection from falls of up to 6.6 feet. It is quite bulky, but the transparent back allows Samsung’s design to shine through and the bumper section comes in black or rose.